We'll be attending Microsoft's annual Build event next week in San Francisco. We're really excited about where Microsoft is headed with Windows updates, and innovations in other technologies. The "one Microsoft" vision is unfolding before us, with the melding of the best aspects of recent Windows versions into a single Windows 10 platform. Windows 10 will be a logical upgrade for any consumer running reasonably recent versions of Windows. Windows 7 - 8.1 consumers will be offered it free of charge, making it a no-brainer upgrade for those users. We really appreciate Microsoft's renewed focus on the importance of the desktop, where Universal apps will now be able to run alongside their Win32 app counterparts. Speaking of the desktop, it's just as important as ever on PCs, especially in Windows 10. We are fully committed to continuing development of new UI controls and products for the WPF platform. Our current primary development focus is working on a massive update to our very popular WPF Docking/MDI product to add a whole host of new features. Check out prior blog posts for some details on what's coming and look for many more in the near future. In regards to Universal apps, we will be updating our WinRT XAML controls to target the Universal app platform over the coming months so that they are ready for use in developing Windows 10 apps. The most recent release of those controls added a new task board control, an advanced Python language for our SyntaxEditor code editor control, bar code display controls, and more. See you at Build 2015! The 2015.1 versions of our WPF, Silverlight, and WinRT/XAML controls were released a couple weeks ago and in today's post I'd like to highlight one of the great new controls that were introduced in that version: TaskBoard. A task board consists of zero to many columns, each of which can contain zero to many cards. Columns and cards can be dragged and reordered, using pleasing animations. Let's see an example to give you a picture of how it all works. In the demo below, we have a TaskBoard control that is being utilized for a task planning system, commonly used in project management to help organize the priorities of a team. The columns represent task groupings, and the cards represent individual tasks. Each column has a header and optional footer that surrounds the contained card items. In this sample, each column header specifies the task grouping name and the column footer contains an "Add a task" button. The footer of the overall TaskBoard control contains an "Add a list" button, which shows at the end of the list of columns. The entire UI of the task board can be fully customized. The cards can show any custom content as well, or can vary content based on data template selectors. The TaskBoard control is designed for MVVM usage and makes it easy to fully alter the appearance of the entire layout with properties for column/card spacing, padding, corner radius, etc. Best of all, rich animations are used whenever dragging columns or cards. TaskBoard also works great with touch input. Use it to create task planning systems on large touchscreen displays. The full source TaskBoard demo seen above is included in the sample projects that ship with our WPF, Silverlight, and WinRT/XAML controls, and is available for you to check out today. Let us know what you think after you try it! WPF Controls 2015.1 build 621 has been released and is now available for download. This build has several new minor features. Due to a certain initialization bug that was located in the original 2015.1 release, it is highly recommended that customers who have downloaded 2015.1 build 620 upgrade to this new build. In today's post, we'll show the optional Find All button that was recently added to the SyntaxEditor (WPF, Silverlight, and WinRT/XAML platforms) EditorSearchView control. SyntaxEditor has always had the ability to perform "find all" searches programmatically, however we received feedback from numerous customers looking to add this to our EditorSearchView control so that their end users could also access it. The EditorSearchView control seen above shows the new Find All button visible. 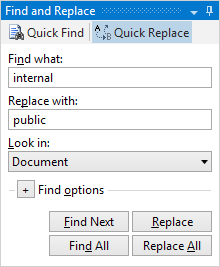 Note that it is not visible by default (the new EditorSearchView.IsFindAllButtonVisible property defaults to false) since unlike the other find and replace operations, there is no automatic UI change in the editor itself for a find all operation. Instead, you need to display the results somehow, such as in a find results list. This screenshot shows an example find results list. The full source code for this sort of setup is included in the samples that come with SyntaxEditor. Providing the ability for your app's end users to find all instances of search text is certainly a handy addition. The features described above are available in our latest WPF, Silverlight, and WinRT/XAML control versions and are available for use. In today's post I'd like to show a new feature that was recently added to SyntaxEditor (WPF, Silverlight, and WinRT/XAML platforms): move selected lines up or down. Moving a range of selected lines from one place to another is a very common task in any text editor. Of course this can be accomplished by cutting and pasting the selection around. But for small adjustments to the location of several lines, the ability to simply move the lines is a valued feature. We've added the ability to move selected lines up and down via the Alt+Up and Alt+Down keys respectively. Let's see a couple examples of it in action. In this sample, I selected the lines that contain the AnotherMethod method. Then I pressed Alt+Up several times to move the method above the Bar method. I then pressed Alt+Down to move the lines back down to their original position. In this second sample, I had a comment that wasn't in the right place and I wanted to move it up. I just put the caret on the line and pressed Alt+Up a couple times to move it back to the right spot above the color property declaration. The ability to move selected lines up and down is a real productivity enhancer when doing text editing.